It's been a full six months since Mr. Destructo last heard from its far-flung correspondent, international best-selling author Dan Brown. He filed a top-notch story from the murder scene where police found a census worker dead with the word "FED" carved into his body, then seemed to disappear. We didn't worry about his being tracked by the real killers; Dan's too smart for that. We assumed he had gone deep undercover, immersing himself in his topic and preparing to bust a story wide open, determined to shock the world. Instead, he seems to have been determined to slip between the covers with a totally different journalistic organ. Sansworth slowly brushed the crackling dust from the tablet’s face in the pale light of his flashlight which he held above himself like a beacon. Sweat ran down his smoothly shaved face, dripping into the floor below, which was also covered in dust, the dust it had been covered with for thousands of years, since man last set foot in this sacred temple. His hands were shaking with the anticipation that he felt. This tablet could prove his theories and vindicate him to the academic community. I don't know who this "Brendle" character is who seduced Dan to another website. If there's a word for what kind of man he is, it surely isn't one in Klingon, because he has no honor. That doesn't matter. I'm not really mad at him. It's senseless to rage at the lover of a spouse for creating an affair. The lover made no promises to you and has none to break. It is the spouse who was unfaithful to the pledge he or she made. Thus I'm angriest at Dan. He and only he can break the pledge he's made to me. He knows why this is important. 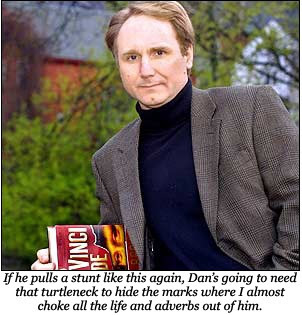 If anyone should know the value and meaning of words, it's Dan Brown. Moreover, he should remember the great lengths that the good people of Mr. Destructo went to, in accommodating him. We fired our intern Jeannette to give enough space to his personal assistant, Ms. Glacia Venturi. We instructed all other support staff not to call him Mr. Brown but rather to refer to him as the "Siegfried and Vidal Sassoon Chair of the Literalogy Department at Georgeburg University," going so far as to reprimand one young man who had "dared" to voice only the initials. We obligingly referred to both his restored metallic-peach 1965 Buick Wildcat and his upper body development as "The Cat-5." We all bought sportcoats with leather elbow patches. For this we were repaid in an exclusive for another website. In the days preceding a season of Jesus and the celebration of his resurrection, Dan proved himself the Judas goat — assuming, of course, that Dan doesn't believe he's proved that Judas didn't exist or was actually a Reverse Dracula, sent to battle Jesus, who was an actual Dracula. Who knows? What I do know is that so long as I draw breath and he draws a check from this website, this behavior is unacceptable. Dan Brown, consider yourself officially on notice.